For the American professional basketball player, see Marshall Rogers (basketball). William Marshall Rogers III (January 22, 1950 – March 24, 2007), known professionally as Marshall Rogers, was an American comics artist best known for his work at Marvel and DC Comics in the 1970s. Detective Comics #475 (Feb. 1978). Cover art by Rogers and Terry Austin. The story "The Laughing Fish" is considered a Batman classic. would keep my parents happy, because it's a legitimate profession, and would allow me some artistic outlet as I worked. Well, I quickly found out that the world wasn't ready for another Frank Lloyd Wright ... and I would end up doing parking lots and designing heating / cooling systems. I had wanted to draw and be imaginative. And then there was one last stumbling block, and that was calculus. ... I just couldn't grasp those weird theories that were running around. He studied architectural drawing, and his work was characterized by detailed rendering of buildings and structures. At some unspecified point, Rogers recalled, he "bounced in and out of a shipping clerk job" and did some retouching work for DC Comics on reprints of 1940s Batman stories. He continued showing samples to both Marvel and DC, and in 1977, his artwork began interesting Marie Severin and Vince Colletta, the two companies' respective art directors. "That got me my first job; it wasn't really the drawing ability", he said in 1980, "as much as my design capabilities." Some of his first comic-book work appeared in the black-and-white magazine The Deadly Hands of Kung Fu, where he worked with writer Chris Claremont on a story featuring the "Iron Fist" supporting characters Misty Knight and Colleen Wing as the Daughters of the Dragon. He eschewed the grey wash that was used in other black-and-white comics stories in favor of applying screentone. With writer Steve Englehart, Rogers penciled an acclaimed run on the Batman in Detective Comics #471-476 (Aug. 1977 - April 1978), providing one of the definitive interpretations that influenced the 1989 movie Batman and that was adapted for the 1990s animated series. The Englehart and Rogers pairing was described in 2009 by comics writer and historian Robert Greenberger as "one of the greatest" creative teams to work on the Batman character. DC Comics writer and executive Paul Levitz noted in 2010: "Arguably fans' best-loved version of Batman in the mid-1970s, writer Steve Englehart and penciller Rogers's Detective run featured an unambiguously homicidal Joker...in noirish, moodily rendered stories that evoked the classic Kane-Robinson era." In their story "The Laughing Fish", the Joker is brazen enough to disfigure fish with a rictus grin, then expects to be granted a federal trademark on them, only to start killing bureaucrats who try to explain that obtaining such a claim on a natural resource is legally impossible. The supervillain Deadshot was redesigned by Rogers during his Detective Comics run. Rogers also penciled the origin story of the Golden Age Batman in Secret Origins #6 (Sept. 1986) with writer Roy Thomas and inker Terry Austin. The two also did a sequel miniseries, Batman: Dark Detective, and worked together on other series, including Marvel's The Silver Surfer and a short run on DC's revived Mister Miracle. Englehart and Rogers' first Batman run was collected in the trade paperback Batman: Strange Apparitions (ISBN 1-56389-500-5), and the second run in Batman: Dark Detective (ISBN 1-4012-0898-3). Rogers remained as artist on Detective Comics for a few issues after Englehart's departure from the series. With writer Len Wein, he co-created the third version of the supervillain Clayface. Rogers' other Batman work included a story arc in Batman: Legends of the Dark Knight that was begun by writer Archie Goodwin and completed by James Robinson. An Englehart-Rogers story featuring Madame Xanadu that sat in inventory for a few years was published as a one-shot in 1981, in DC's first attempt at marketing comics specifically to the "direct market" of fans and collectors. In 1986, Rogers drew a graphic novel adaptation of "Demon with a Glass Hand", an episode of The Outer Limits television series, based on a script by Harlan Ellison. It was the fifth title of the DC Science Fiction Graphic Novel series. At Eclipse Comics during the early 1980s, he collaborated on the graphic novel Detectives Inc. with writer Don McGregor, drew the Scorpio Rose series and the first Coyote series written by Englehart, and wrote and drew his own whimsical series Cap'N Quick & A Foozle. In 1992, McGregor and Rogers crafted a two part-story for Marvel in Spider-Man issues #27-28 dealing with bullying and gun violence. Rogers' mother was Ann White Rogers. He had a sister, Suzanne, and an adopted son, Russell Young. Rogers died on March 24, 2007, at his home in Fremont, California. His Batman collaborator Steve Englehart said he was told by Spencer Beck, Rogers' agent: "His son found him. They think it was a heart attack, and that he might have been dead for a while." In 1989, he was the first artist to work on the new Batman newspaper comic strip. Rogers drew the strip from its launch on November 6, 1989 until the conclusion of its first storyline on January 21, 1990. The entirety of Rogers work on the strip was reprinted in Comics Revue #41-43. ^ a b William Marshall Rogers III, Social Security Number 084-38-8742, at United States Social Security Death Index via FamilySearch.org. Accessed March 2, 2013. ^ a b "Batman Artist Rogers is Dead". SciFi Wire, Syfy.com. March 28, 2007. Archived from the original on July 9, 2007. Even though their Batman run was only six issues, the three laid the foundation for later Batman comics. Their stories include the classic 'Laughing Fish' (in which the Joker's face appeared on fish); they were adapted for Batman: The Animated Series in the 1990s. Earlier drafts of the 1989 Batman movie with Michael Keaton as the Dark Knight were based heavily on their work. ^ Englehart, Steve (March 1980). "From Detective to Detectives, Inc.: An Interview With Marshall Rogers". The Comics Journal. Introduction, reprinted from 1979 New York Comic Art Convention program book (54): 56. Archived from the original on October 24, 2011. Retrieved October 24, 2011. ^ a b c d Tidwell, Beau (March 29, 2007). "Marshall Rogers, 57, Artist Who Drew Batman Comics, Dies". The New York Times. Archived from the original on October 28, 2011. Retrieved December 13, 2010. Rogers drew highly detailed architectural features for the moody backdrops of Batman's exploits, down to the individual bricks in the buildings of Gotham. ^ a b c d Rogers interview, The Comics Journal (54): 57. Archived from the original on October 24, 2011. Retrieved October 24, 2011. ^ "An Interview With Marshall Rogers". Swashbucklers. fanzine: Don Secrease, editor-publisher; reprinted at Marshall Rogers Fan Site (2). Spring 1980. Archived from the original on October 24, 2011. Retrieved October 24, 2011. 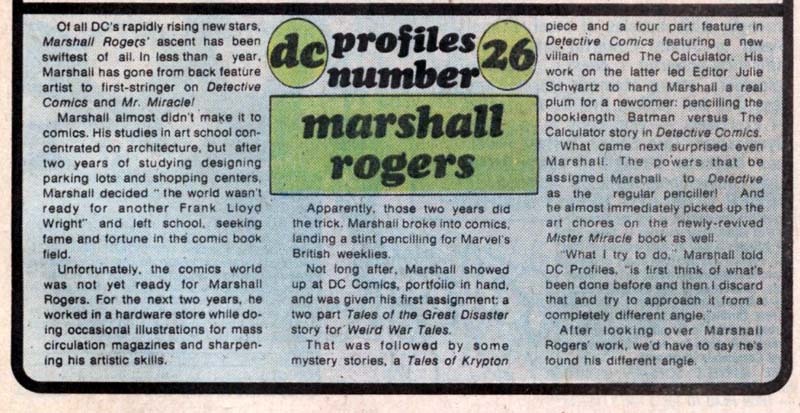 ^ a b c "From Detective to Detectives Inc." An Interview with Marshall Rogers". The Comics Journal (54): 58. March 1980. Archived from the original on October 24, 2011. Retrieved October 24, 2011. ^ Greenberger, Robert; Manning, Matthew K. (2009). The Batman Vault: A Museum-in-a-Book with Rare Collectibles from the Batcave. Philadelphia, Pennsylvania: Running Press. p. 27. ISBN 0-7624-3663-8. Batman was now a true creature of the night, and every artist and writer team worth their creative salt wanted a piece of him. One of the greatest of such pairs consisted of writer Steve Englehart and artist Marshall Rogers...when Rogers joined Englehart in Detective Comics issue #471 (August 1977), their styles meshed with such ease that the result gave the impression of years' worth of collaboration. ^ Levitz, Paul (2010). "The Bronze Age 1970-1984". 75 Years of DC Comics The Art of Modern Mythmaking. Cologne, Germany: Taschen. p. 489. ISBN 9783836519816. ^ Greenberger and Manning, p. 163: "In this fondly remembered tale that was later adapted into an episode of the 1990s cartoon Batman: The Animated Series, the Joker poisoned the harbors of Gotham so that the fish would all bear his signature grin, a look the Joker then tried to trademark in order to collect royalties." ^ McAvennie "1970s" in Dolan, p. 179: "Writer Len Wein and artist Marshall Rogers vividly depicted Batman's battle with a third Clayface." ^ Manning "2000s" in Dougall, p. 250: "Archie [Goodwin] was unable to complete the assignment for health reason. Writer James Robinson was hired to finish this interesting examination of the new mercenary Brass and the Wayne legacy. Aided by the art of Marshall Rogers, this story was a fine tribute to Goodwin's brilliant body of work." ^ Catron, Michael (June 1981). "DC Taps Fan Market for Madame Xanadu". Amazing Heroes. Fantagraphics Books (1): 25. Madame Xanadu, a 32-page/$1.00 comic that marks DC's first attempt at marketing comics specifically to fans and collectors, went on sale in early April. The book contains a 25-page tale by Steve Englehart and Marshall Rogers entitled 'Dance for Two Demons' ... The tale was originally commissioned for Doorway to Nightmare but was put into DC's inventory when that title was cancelled. ^ Contino, Jennifer M. (March 26, 2007). "R.I.P. Batman Artist Marshall Rogers". The Pulse (column), ComiCon.com. Archived from the original on October 24, 2011. Retrieved July 5, 2008. ^ "Eagle Awards Previous Winners 1978". Eagle Awards. 2013. Archived from the original on October 23, 2013. Retrieved November 3, 2013. ^ "Inkpot Award Winners". Comic Book Awards Almanac. Archived from the original on July 9, 2012. ^ "Eagle Awards Previous Winners 1979". Eagle Awards. 2013. Archived from the original on October 23, 2013. Retrieved November 3, 2013. ^ Kronenberg, Michael (February 2011). "How the Batman Nearly Stepped Out of the Mainstream and into Independent Comic". Back Issue!. Raleigh, North Carolina: TwoMorrows Publishing (46): 26. Marshall did a portfolio called 'Strange' in 1979 that had Batman-esque plates, sans Batman. ... It is also worth noting that in 1981, courtesy of Sal Quartuccio Publishing, Marshall Rogers released 'The Batman', a color portfolio consisting of four plates (if you purchased the signed edition of the portfolio, you received a fifth plate) that allowed Rogers to illustrate Batman and his world unencumbered by comic book panels. ^ Greenberger and Manning, p. 41: "Shortly after the 1989 feature [film], Batman even returned to the funny pages for a bit, in a comic strip by...legendary artist Marshall Rogers." Marshall Rogers Fan Site, Cavalli, David, ed. This page was last edited on 15 January 2019, at 20:44 (UTC).